(Bloomberg Opinion) -- Emerging markets are missing out on the trade of the decade. Green shoots are everywhere. China's factory activity is finally stabilizing, and the Federal Reserve may even cut interest rates this year. Both should be great news for stocks around the world. But nervous investors are busy selling instead, redeeming $2.6 billion of their holdings in emerging-markets ETFs over the last three weeks. 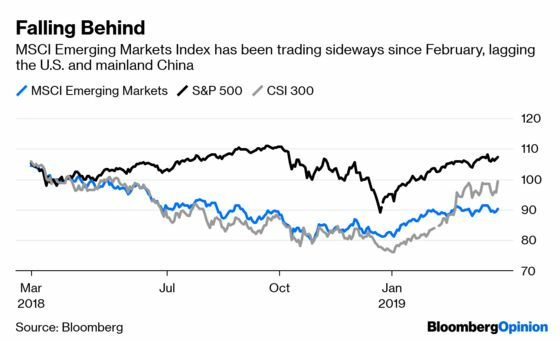 Other than China and India, which saw billions of dollars of foreign buying on bets that Prime Minister Narendra Modi will get re-elected, developing markets have languished, trading sideways since February. That’s despite China and the U.S. reopening their liquidity taps. Things will only get worse from here. Unlike in the past, a stronger China is now bad news for the rest of the asset class. One key reason is that China soon will be competing for foreign-capital inflows just as fiercely as it did for global trade. The export-oriented manufacturing juggernaut is turning into a deficit nation. Contrary to President Donald Trump’s perception, China is no longer a frugal nation that sells a lot abroad and buys little in return. The country’s middle class is now traveling and swiping plastic overseas. 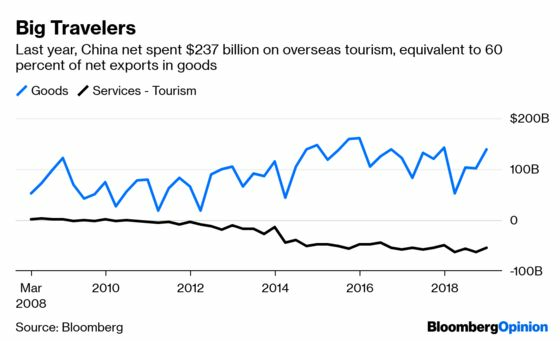 Last year, more than 160 million Chinese visited foreign countries, spending $237 billion on everything from rice cookers in Japan to Gucci loafers in Italy. 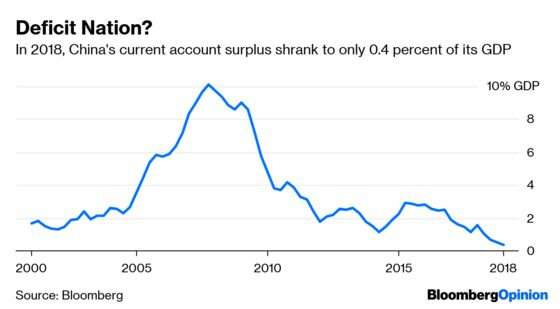 As a result, China’s current account surplus has collapsed. Edging dangerously close to twin deficits – both fiscal and current account – Beijing is now keen to attract foreign portfolio inflows to balance its external accounts. That’s why, all of a sudden, China is opening its financial-services industry, allowing global investment banks to take majority control of their local brokerage joint ventures. Make no mistake: Beijing will put its best face forward to get you to open your wallet. It’s also debatable whether other developing nations can benefit from China’s latest stimulus package. Recall how Beijing led emerging markets from the deflationary slump of 2016: supply-side reform, as unused coal mines and steel mills were shuttered. Commodity prices climbed as a result, setting the stage for the sector’s bull run the following year. Fast forward to 2019. 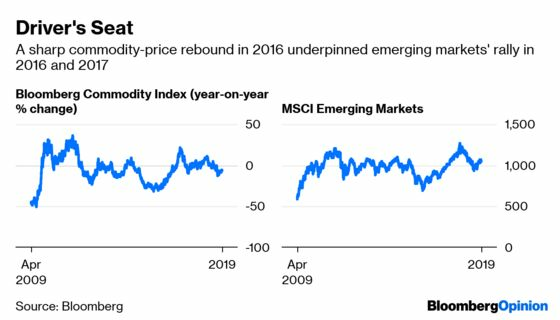 While commodity prices have risen, the climb isn’t sharp enough to help emerging markets outperform again. The same old trick can’t work twice. This year, Beijing is focused on tax cuts and boosting domestic consumption. If China succeeds, new demand for imports will probably go to final products, such as designer bags from Italy, luxury cars from Germany and biotech drugs from the U.S. Developing nations’ raw-materials exports will be second order. Right now, China isn’t a hard sell compared with its emerging-market peers. The country is unleashing massive stimulus; and a lot of passive money will flow in simply thanks to the updated composition of global stock and bond indexes. In a weakening global environment, investors are getting choosier about where their marginal dollars go. Emerging markets may hope that China’s rising tide will lift all ships. But they could end up sinking in its swell.